If you're searching for a casual yet stylish outfit, pair a dark brown parka with charcoal skinny jeans. As well as totally comfortable, these two garments look amazing paired together. You could perhaps get a little creative in the shoe department and spruce up your look with black leather ankle boots. If you're all about functionality dressing when it comes to fashion, you'll love this cute pairing of an olive sweater dress and black leather leggings. Sporting a pair of black leather ankle boots is an easy way to add some flair to your outfit. If you're in search of a casual yet absolutely chic outfit, wear an olive bomber jacket and navy skinny jeans. As well as totally comfy, both garments look great when worn together. Add a glam twist to your look with VAGABOND SHOEMAKERS Marja Cap Toe Bootie from Nordstrom. If you're hunting for a casual yet totaly chic ensemble, try teaming a black coat with a grey sweater dress. These two pieces are very comfortable and will look stunning when worn together. When it comes to footwear, this look is finished off nicely with black leather ankle boots. 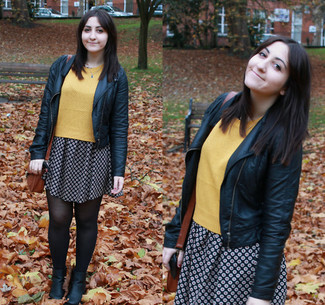 A black leather biker jacket and a mustard crew-neck sweater is a nice combination to add to your casual lineup. Rock a pair of black leather ankle boots to va-va-voom your outfit. For a casually elegant outfit, consider wearing a beige trenchcoat and a beige print chiffon shift dress — these two pieces play pretty good together. When it comes to shoes, this look is finished off nicely with black leather ankle boots. If you're obsessed with relaxed dressing when it comes to your personal style, you'll love this totaly stylish pairing of a white knit oversized sweater and black leather leggings. 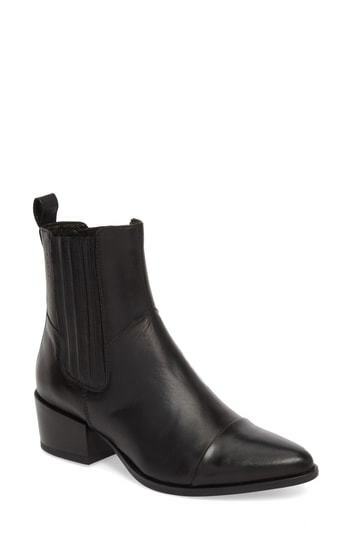 For footwear, go down the classic route with VAGABOND SHOEMAKERS black leather ankle boots. 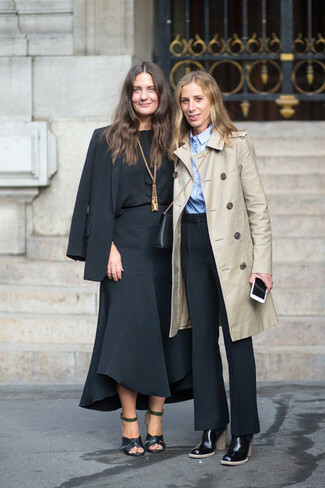 For a neat-meets-stylish look, pair a beige trenchcoat with black dress pants — these two pieces go nicely together. When it comes to shoes, this getup is finished off nicely with VAGABOND SHOEMAKERS Marja Cap Toe Bootie from Nordstrom. If you're in search of a casual yet chic getup, go for a black quilted leather biker jacket and a grey skater dress. As well as super comfy, both of these pieces look great paired together. Rocking a pair of black leather ankle boots is an easy way to add extra flair to your ensemble.